Meridian Technology Center will offer a new Energy and Power program beginning fall 2018. Representatives from the school met with members of the program’s Business and Education Council to discuss the curriculum. STILLWATER, Okla. – High school students and adults throughout the Meridian district will be able to get plugged into the school’s new Energy and Power program this fall. “The way the world generates and consumes energy is constantly changing and the Energy and Power program will explore how to move technology forward into new areas of innovation,” said DeAnna Little, Director of Instruction of Trade and Industry programs at Meridian. The new program is the result of increasing workforce demands in the energy and power sector within the Meridian district and across the nation. A 2017 U.S. Energy and Employment Report estimates that the energy and power sector employs 6.4 million workers nationwide, and nearly 93,000 energy workers in Oklahoma. The governor’s Oklahoma Works initiative estimates that the energy ecosystem will experience a 16 percent job growth by 2025. The one-year Energy and Power program will provide a workforce to help fill the gap. Students in the program will explore five types of energy that include mechanical, heat, chemical, electromagnetic and nuclear power. It incorporates hands-on projects to understand the interplay of the generation, distribution and use of energy. It will be available to high school students and adults. Vernon Hall, Electric Distribution Superintendent for the city of Stillwater, serves as a member of the new program’s Business and Education Council. He and other council members have provided input to help shape the program’s curriculum. He has worked with the city since 1984, and throughout his career he has witnessed the industry growth first-hand. Students will work with renewable and non-renewable energy generation, transformers and the electrical grid to understand how energy travels along power lines. They will also gain experience with construct motors, pumps, heat exchangers, hydraulics and pipeline systems. For more information about the program visit meridiantech.edu/programs/energyandpower. Meridian serves high school and adult students who live in the Agra, Carney, Glencoe, Guthrie, Morrison, Mulhall-Orlando, Pawnee, Perkins-Tryon, Perry and Stillwater school districts. High school, home-school and virtual school students who live in the district can attend tuition free during their junior and senior years. Sophomores can enroll for afternoon programs when space is available. The STEM Academy with Biomedical Sciences and Pre-Engineering programs is open to sophomores, juniors and seniors. Students spend a half day at their home high school and half a day with Meridian in hands-on courses. Meridian is tuition free for district high school students and includes free transportation from their home high school. Students can receive credit for high school courses in a variety of academics or as electives depending on their high school. The high school recruitment process for fall 2018 is already under way. Over the last two months, Meridian’s career counselors visited with students at their high schools and discussed how Meridian can be a part of their high school experience. The adult enrollment process begins April 1. Adult students can enroll in any of Meridian’s career training programs, with the exception of the STEM Academy. Evening Cosmetology, Health Informatics, Practical Nursing and Radiological Technology are adult-only programs and have separate applications and deadlines. Tuition varies for each program. Please see the Cost Sheet information located on the program’s information page at meridiantech.edu/programs. 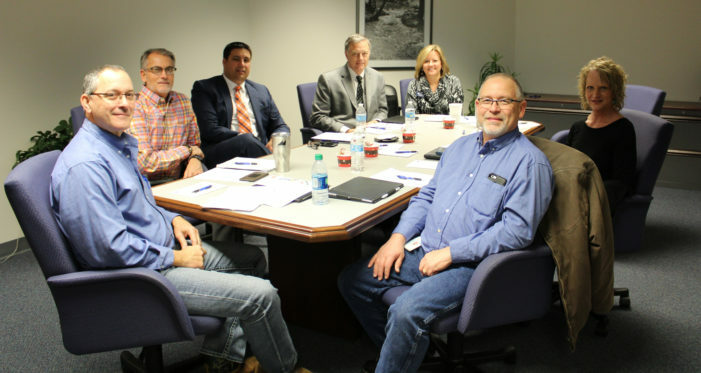 Photo: From left to right is Curtis Schmidt, City of Stillwater Generation and Transmission Superintendent; Dr. Douglas Major, Meridian Technology Center Superintendent/CEO; Daniel Thrasher, Central Electric Cooperative Vice President of Business Unit Development; Todd Heimer, Central Electric Cooperative Executive Vice President of Engineering; DeAnna Little, Meridian Technology Center Director of Instruction; Jeanie Zagar, Meridian Technology Center Executive Director of Career Planning/Career Development; and Vernon Hall, City of Stillwater Electric Distribution Superintendent.